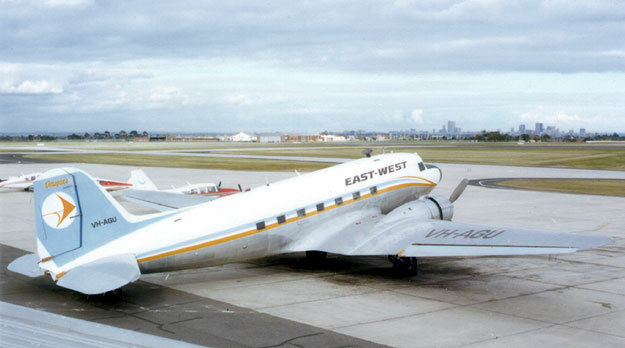 Douglas DC-3C-S1C3G VH-AGU (c/n 32688) was wet-leased from East-West Airlines by the Department of Transport in the 1970s for development testing of the INTERSCAN Microwave Landing System (MLS). 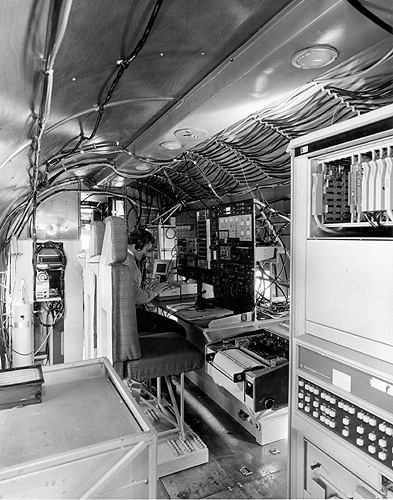 The photo above shows the aircraft at its Melbourne/Essendon base in June 1975 during the trials. 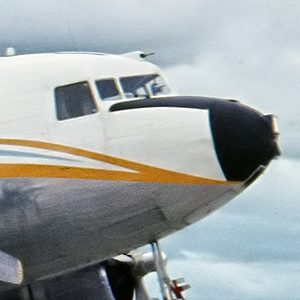 Note also the light fitted on the nose of the aircraft, seen enlarged at left, to facilitate tracking of the aircraft's flight path by a ground party. The MLS experimental system itself was installed at Melbourne/Tullamarine in 1974 - click here to see a photo. The two images above also show VH-AGU at Essendon in the 1970s. The upper photo of VH-AGU looks south across Runway 26/08 toward the Melbourne City skyline. In the lower image, the van at left contained a Ground Monitoring unit for the MLS. 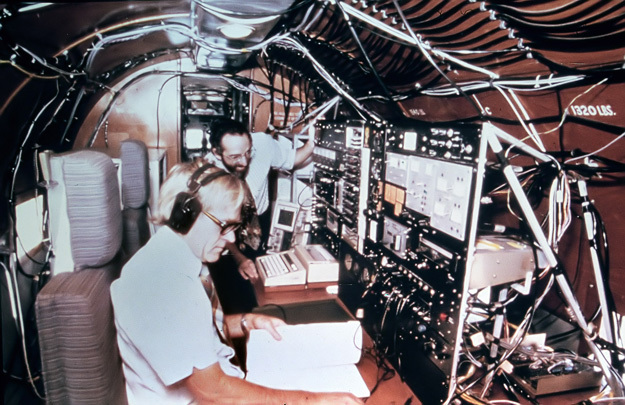 Left and below: The interior of VH-AGU was equipped with comprehensive test equipment to measure the performance of the MLS. Brian O'Keeffe recalls: "I flew in[VH-AGU] for a great many hours ! AGU had quite a history as it was the 'VIP' aircraft for the Commonwealth Bank. It had a strange interior of 3-ply for the cabin walls. This made it easy to run cables up and down the aircraft: we just nailed them to the 3-ply. Then we borrowed a radio altimeter from the French Civil Aviation. 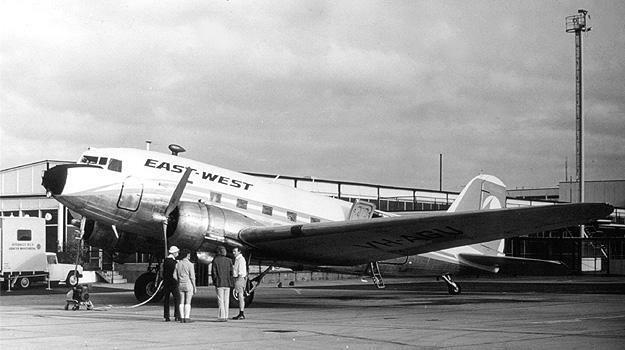 [It] must have been the first DC-3 to have one. Also the latest Flight Director. Must have been the most instrumented DC-3 in history! Click here to play a short movie (.mp4 format) showing VH-AGU and the on-board MLS test equipment. VH-AGU was originally constructed for the USAAC in 1944 as a C-47B-35-DK and allocated the military serial 44-76336. In February 1945 it was acquired by the RAAF and allocated the serial A65-72. Operated until 1959, it was then sold to Adastra Airways and converted for civil use as a survey aircraft. 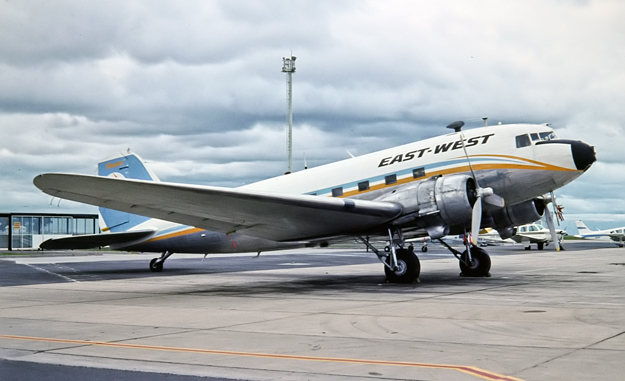 In October 1964 the aircraft was re-registered to Sepal Pty Ltd, but in October 1969 it was transferred to Adastra Aerial Surveys Pty Ltd.
Adastra Aerial Surveys was acquired by East-West Airlines Ltd in April 1973 and VH-AGU was re-registered to East-West Airlines on 12 November 1974. East-West won the MLS trials support contract in December 1974 and VH-AGU was re-painted in East-West colours at Tamworth in the month prior to positioning at Melbourne/Essendon for the commencement of the contract on 25 January 1975. The contact was for 3 years with options to extend and it appears to have been extended twice before terminating on 10 August 1979. At some stage in the late 1970s the aircraft was transferred to South Coast Aviation, another East-West subsidiary. The aircraft was withdrawn from service in August 1979 at Essendon at the conclusion of its Departmental charter, and sold to Aerodyne Pty Ltd of Moorabbin. VH-AGU passed through the hands of several operators until 1993 when it was acquired by noted warbird restorer Jeff Trappett and ferried to Latrobe Valley for long-term restoration. The aircraft flew again in about 2013, painted in a Vietnam War-era camouflage scheme and remains in airworthy condition.